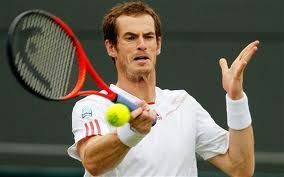 World no.4 and British no.1 Andy Murray plays Frenchman Jo-Wilfried Tsonga in the Wimbledon semi-final on Friday, and a win for the Scot would mean a pair of tickets for Sunday’s final could top 45,000 pounds. Tickets for Murray’s Wimbledon semi-final clash with Tsonga were being sold for more than 4,000 pounds till Thursday night, a newspaper reported. Agency Viagogo.com was last night charging up to 8,523 pounds for a pair of tickets, but director Edward Parkinson said a Murray win would mean a pair could surpass 45,000 pounds by Sunday. If Murray triumphs he will become the first Brit since Bunny Austin 74 years ago to reach the Wimbledon men’s final.